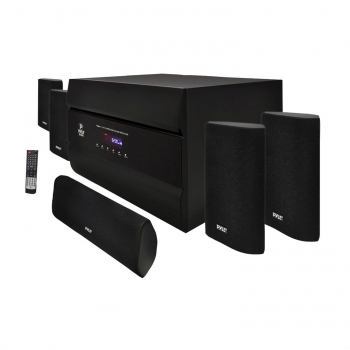 Check out the PT628A, a 400-watt, 5.1-channel home theater system from Pyle. You get four satellite speakers plus a center channel and a subwoofer for a full, rich experience that envelopes you in sound as you watch your favorite dramatic TV shows, films, and sporting events. The PT628A packs an amplifier, pre-amplifier, and AM/FM tuner to get you started. The satellite speakers pack 50 watts each, while the subwoofer has a whole 150 watts of power with a 10” long throw driver for deep, booming bass. The PT628A is compatible with virtually any device equipped with stereo RCA output. Gold-capped A/V cables and wires ensure a high-quality, distortion-free connection between the home theater receiver and your audio-visual equipment. Control it all, including EQ settings, using the buttons on the front of the receiver, or using the included wireless remote control.